> What a great year for insects! In this age of bee and insect doom & gloom I am happy to report a bit of good news! My biggest surprise this year occurred recently when I was taking breakfast in my tiny back suburban garden and to my surprise I saw a lovely red admiral butterfly. A few moments later I saw a completely different butterfly floating among my potted plants. Then ten minutes later my heart leaped, yet another completely different coloured butterfly, none of them the common cabbage white. Three completely different butterfly varieties happily dancing about my city shoebox garden! I really can’t remember the last time I saw any butterflies, let alone three different varieties. It filled me with hope that butterflies and other insect could be on the increase again. After CCD losses of bees in the US and dreadful UK beekeeping for the last seven years, I for one was thrilled to see this little indicator of prospering wildlife. 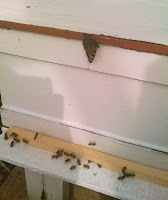 Then when I was beekeeping, gather up the July crop, a lovely peacock butterfly landed on the hive I was working. I managed to grab my phone and took a quick snap. 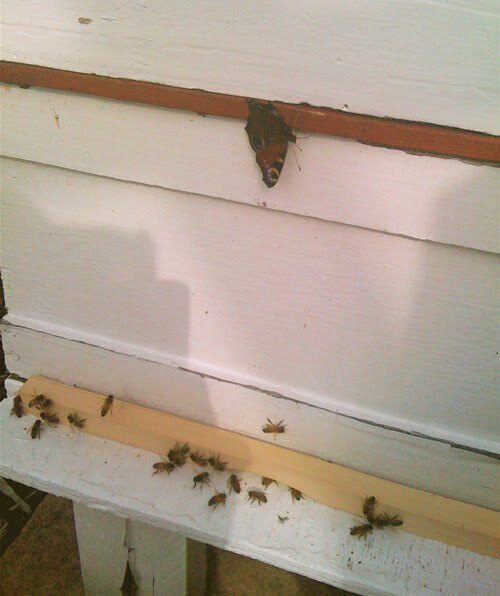 It flew around my head and kept me company for a good hour while I opened and managed the other hives on site. I felt very honoured. If you have spotted any unusual or abundance of butterflies, bees etc email me at The Hive Honey Shop and tell me all about it.